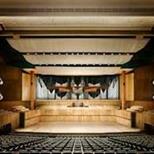 The Royal Festival Hall is a 2,900-seat concert, dance and talks venue within Southbank Centre in London. It is situated on the South Bank of the River Thames, not far from Hungerford Bridge. It is a Grade I listed building - the first post-war building to become so protected (in 1981). The London Philharmonic Orchestra and Philharmonia Orchestras perform the majority of their London concerts in the hall. The hall was built as part of the Festival of Britain for London County Council, and was officially opened on 3 May 1951. When the Greater London Council (LCC's successor) was abolished in 1986, the Hall was taken over by the Arts Council. Since the late 1980s the hall has operated an 'open foyers' policy, opening up the substantial foyer spaces to the public throughout the day, even if there are no performances. This has proved very popular and the foyers are now one of the most used public spaces in London. The closest tube stations are Waterloo and Embankment. A taxi rank is adjacent to Southbank Centre Square on Belvedere Road. If you are arriving at Southbank Centre by taxi, please ask to be dropped off at Southbank Centre Square. Bus number RV1 stops on Belvedere Road. Bus routes 76, 77, 211, 341, 381, 507, N381, N76 and RV1 all stop on York Road, a 5 minutes walk away. Bus routes 1, 4, 26, 59, 68, 139, 168, 171, 172, 176, 188, 243, 521, N1, N68, N171 and N343 stop on Waterloo Bridge, a 2 minutes walk away. There is an infrared system in the auditorium. You can use this by adjusting your hearing aid to the 'T' setting. Headsets can be collected from the Ticket Office. There is a portable sound enhancement system that can be used in other areas. Assistance dogs can be taken into the Auditorium, there are seats in (rows A and AA) that have additional space. Please let the venue know before booking. All levels of the Auditorium can be reached using the JCB Glass lift or the other internal lifts. Please contact 0844 875 0073 (select option 2) if you require additional assistance during you visit or further information.